One of the North East's best known and oldest companies is to be honoured by Newcastle City Council on Tuesday. Ringtons Tea, which is based in Byker, will be presented with the Honorary Freedom by the city's mayor Councillor Peter Arnold. The firm which is 100-years-old, is still owned by the same family, and continues to deliver tea to the door. The Freedom of the City is the highest honour the city can give to an individual or organisation. Others who have received the tribute, are world leaders Nelson Mandela and Jimmy Carter, plus sport stars Jonny Wilkinson and Sir Bobby Robson. Three generations of Smiths including Nigel, Simon and Colin, will receive the honour on behalf of the company during the ceremony at the Discovery Museum. The company was established by Samuel Smith and business partner William Titterington in 1907 when tea was delivered to the door by a horse and cart. 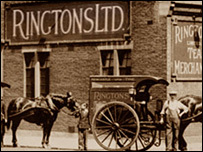 Mr Arnold, said: "For many years Ringtons Tea has not only been a fantastic ambassador for the city economically, but has played a huge role culturally."